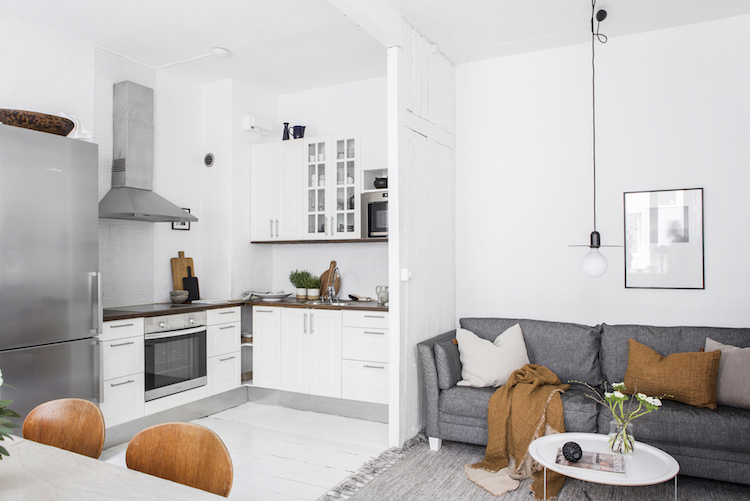 It can be so tricky to strike the right balance between cosy and calm in a small living space, don't you agree? 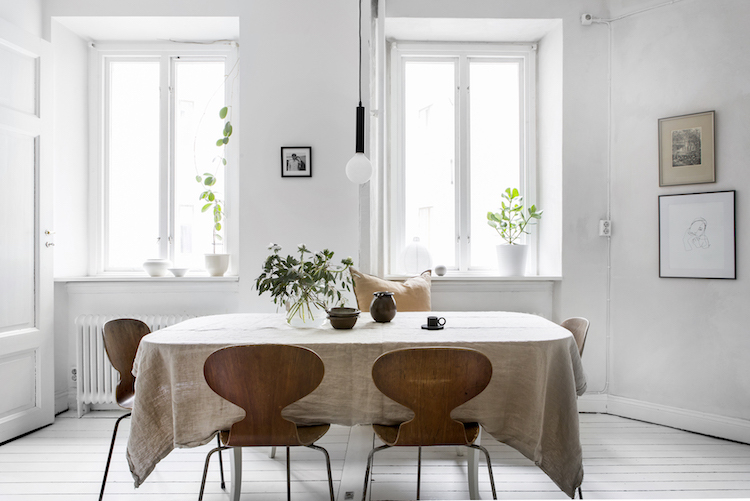 But I think the owner behind this dreamy apartment in Gothenburg has totally nailed it! 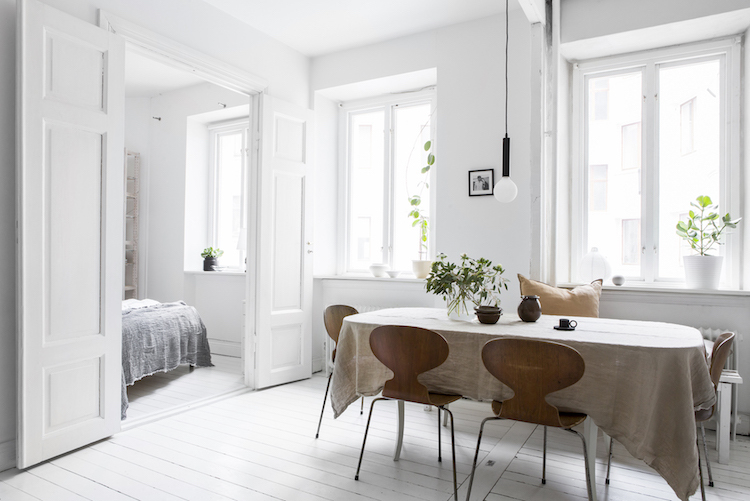 Measuring a teeny 42 square metre (452 square feet), the early 20th century two room flat is fresh and light, yet a wonderful cosy, calm and serene soul. How I'd love to be padding around here while the snow falls outside today, fancy joining me?! The beautiful chestnut throw (similar here) and linen cushion help the cosy living room corner to pop - and don't you also love how the blush linen table cloth adds subtle colour to the dining room. Classic Ant chairs are stackable making them the perfect option for small spaces. I also like the climber in the window (remember this post I recently dedicated to the 'indoor climber'?! Such a big fan, how about you?). The rug is perfect for carving out a distinct living room zone and helping to make it feel snug. I also like the use of multi-purpose furniture like the tray table (this is a fab one). 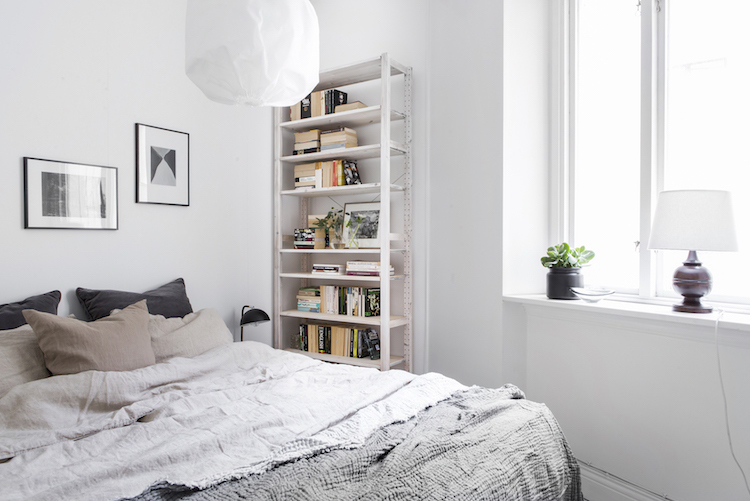 Using book shelves as a bedside table is also a great space-saving idea. You could also add a clamp lamp (like this one) to use for reading. 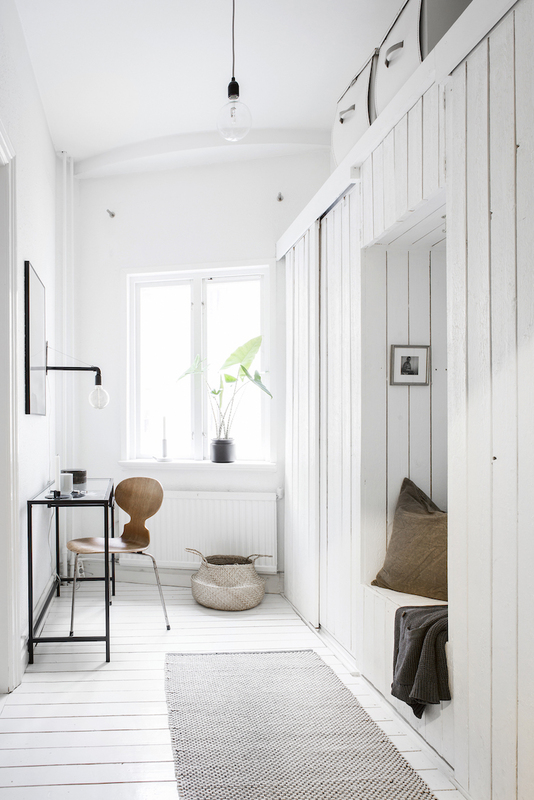 I love the hallway in this home - The wood cladding on the wall-to-wall wardrobe adds such a cosy touch and the built-in seating nook is perfect for getting dressed or getting out of the door! Slim furniture like this desk are perfect for narrow spaces (shelf desks are also handy!). Photography courtesy of Alvhem where this lovely apartment is currently for sale. All in all, a perfect little living space - don't you think?! Could you imagine living here?! In case you're look out for more inspiration, you can find a whole load of small home tours here (scroll passed if this comes up first!). PS In case you didn't get a chance to stop by on Friday, there's an interview with the creative duo behind Our Food Stories and a tour of their lovely Berlin apartment and countryside retreat here (you might just get an idea for tonight's supper too!). Hope you feel as inspired reading it as I did creating it! So minimal and clean! I love it. 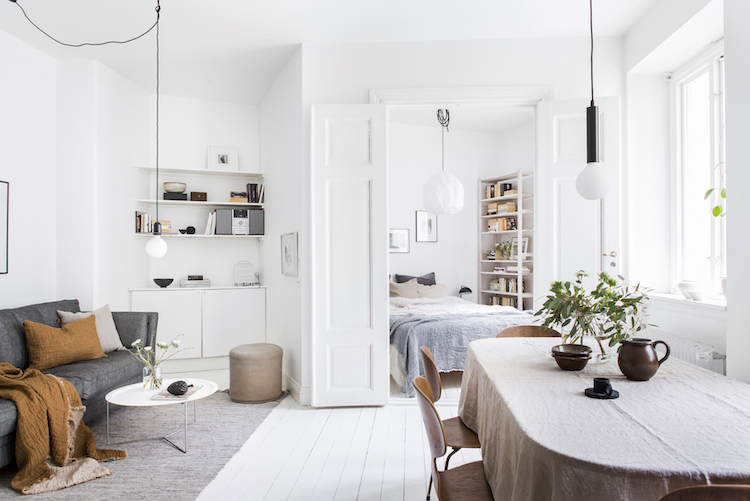 I love that it's minimal and clean too - perfect for a small space! 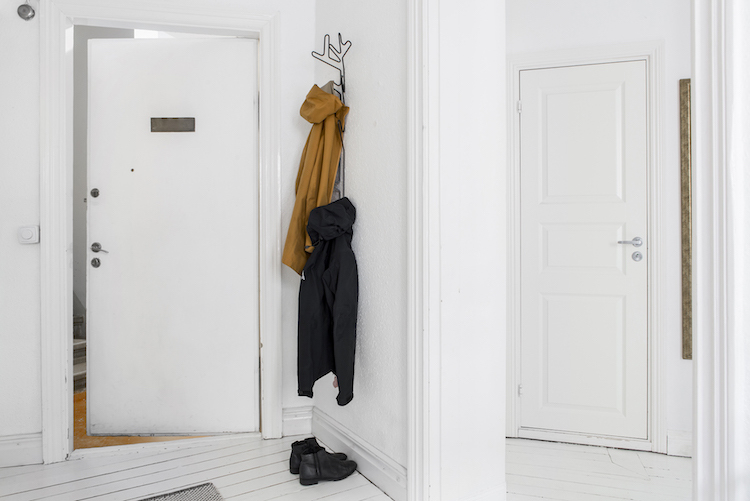 Where can I buy the rug pictured in the hallway? I love it! I’m not sure unfortunately - it is lovely though!